On a recent trip to my friendly neighborhood grocery store I kept coming across movie tie-in merchandise for the upcoming BATMAN V SUPERMAN film! 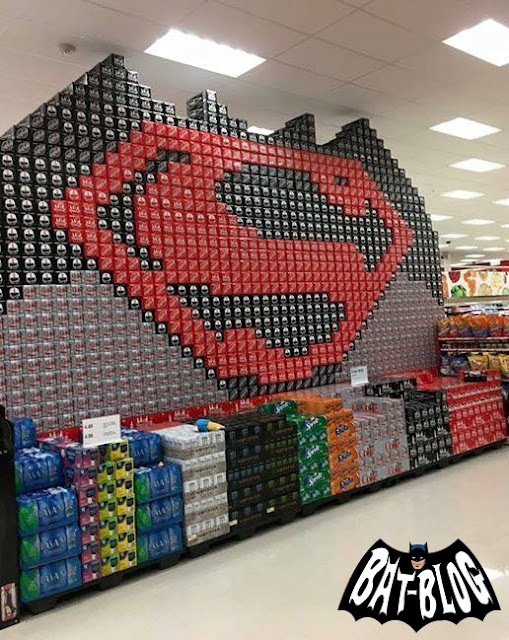 I guess some other people have been too because a Bat-Blog Fan sent us THIS photo of a Dr. Pepper Can Display that is a work of ART! Well, here's what I saw. First, those BATMAN and SUPERMAN Cereal Boxes by General Mills were in the cereal isle (we reported about those a long time ago but I never saw them here where I live until recently). 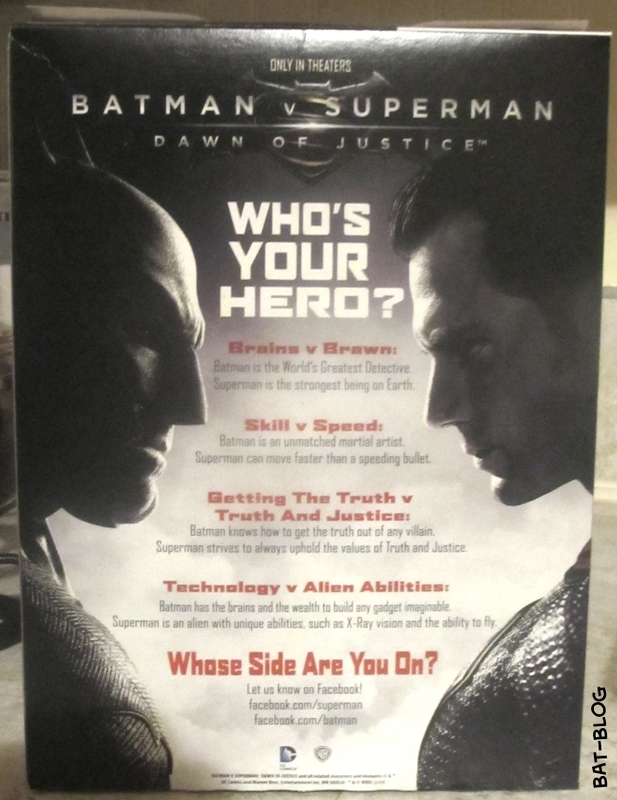 Here's some pics of the front/back of the Batman box (it's the only one I bought). 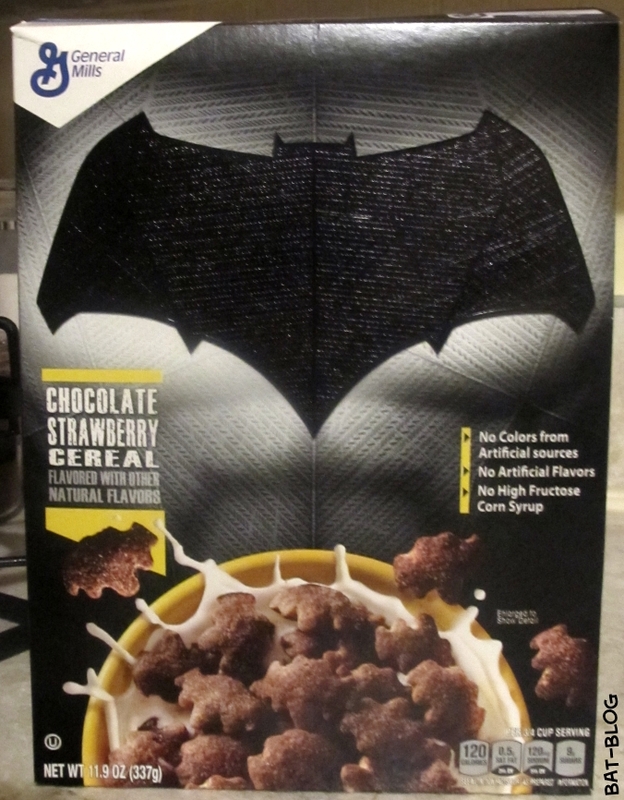 The thing I love about the cereal packaging is that the front of the box does NOT have the word "Batman" (or "Superman"), they just have the logo.... that's actually kinda brave, from a graphic arts point of view. I mean, "Don't put the name of the product ON the product", that's pretty ballsy! 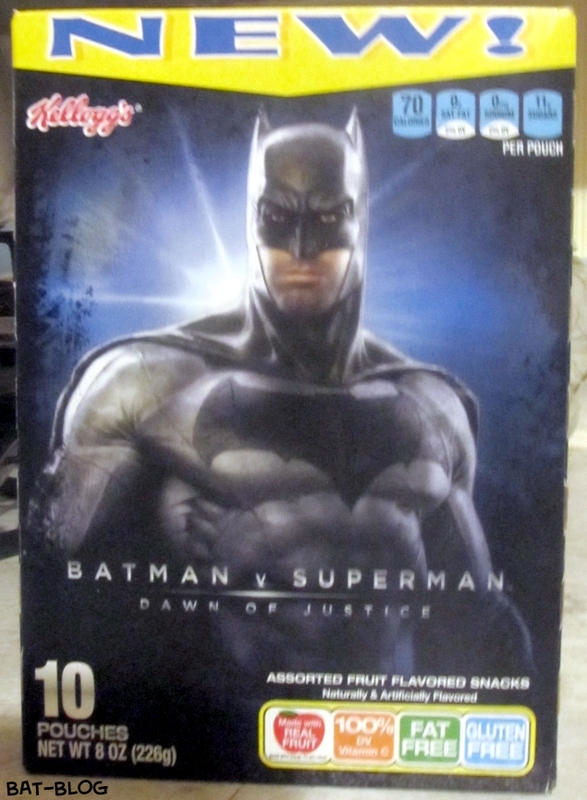 Then, down the way a little bit, Kellogg's had some BVS Fruit Snacks! 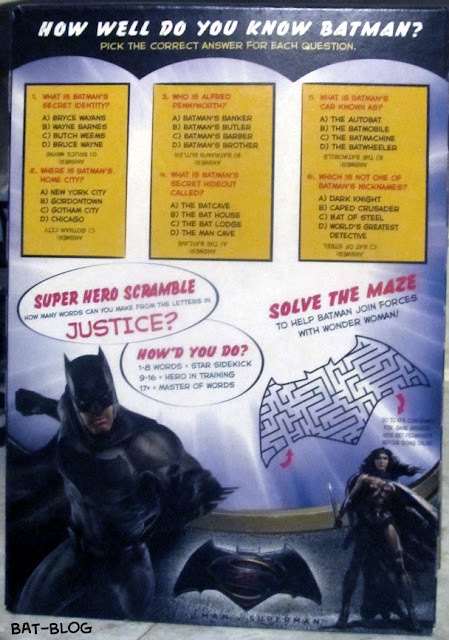 Like the cereals there are 2 different boxes, one with Superman and the other with Batman. Sorry I don't have one of them pictured but I only bought the "Batman" one. The artwork on the front of the box is pretty awesome and there are some fun puzzles on the back! Oh yeah, speaking of DR. PEPPER! They had a 12-pack case of Dr. Pepper with "Batman" on them (box shown down below). Yes, the entire box of regular Dr. Pepper is all "Batman" and if you want to collect the other 5 characters then you gotta buy all the other products. 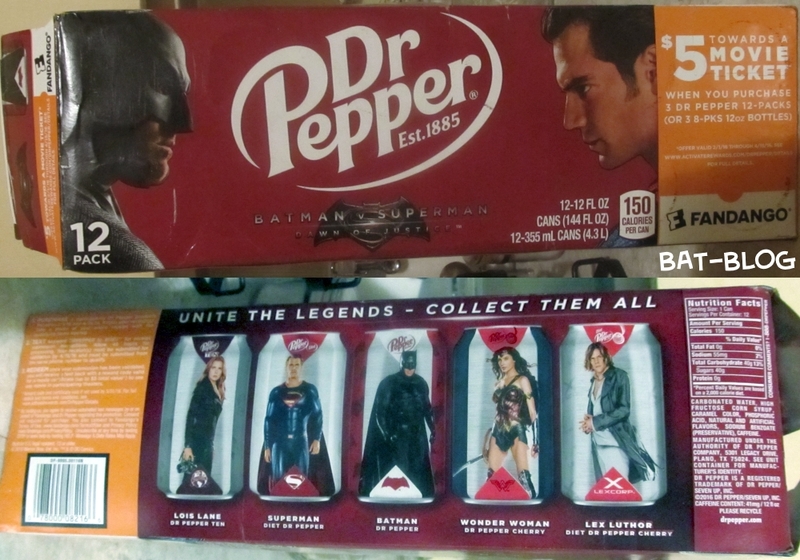 For example: Wonder Woman is Cherry Dr. Pepper, Superman is Diet Dr. Pepper, and so on. If you look at the photo of the box then you can see the whole list. Whoops, almost forgot to mention. 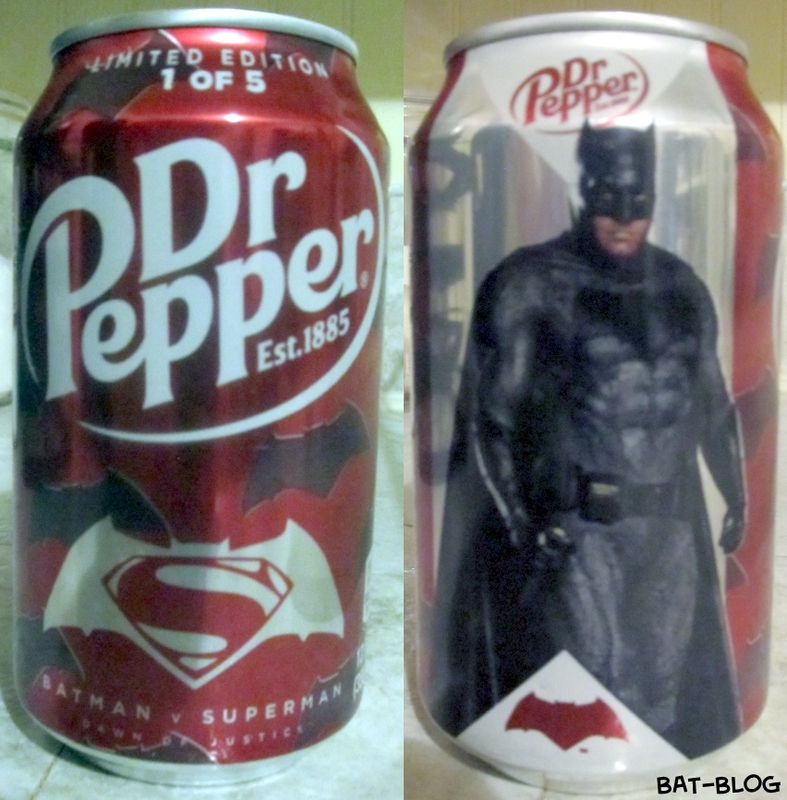 DR. PEPPER has 2 special offers with their products that tie into the movie. First is a Fandango Movie Tickey Offer where you can get $5.00 off your ticket price when you purchase three "in the can" 12-packs or three 8-packs of 12 oz. bottles. Then, there are 5 digital comics which can be opened if you have the Blippar App on your smartphone. Wait, if you just wanna check them out right here, RIGHT NOW, then the BAT-BLOG has them for you to see down below... ENJOY!